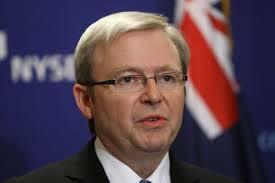 Australia's Prime Minister, Kevin Rudd, arrives in Port Moresby on Sunday, for a two day visit to Papua New Guinea. Mr Rudd will meet with his PNG counterpart, Peter O'Neill, for talks aimed at reinforcing the strong relationship P-N-G enjoys with Australia. Mr Rudd's visit comes a little over two weeks after he defeated Julia Gillard in a dramatic Labor leadership ballot, and returning to the Australian prime ministership post. He and Mr O'Neill will discuss priority bilateral interests, including joint work in policing and health. They will also discuss cooperation on shared regional challenges. Mr Rudd says he plans to discuss the future of the country's major gas project, how to lift the level of security on PNG's streets and how to improve it's hospitals. The level of Australian investment in PNG, including through participation in the landmark PNG LNG project, has grown five-fold in five years and today stands at 19 billion dollars or over 40 billion Kina.